There’s an old political saying that presidential candidates appeal to their parties’ wings — left for Democrats, right for Republicans — in the race for the nomination and then appeal to the center in the general election campaign. It was put in canonical form by Richard Nixon, one of only two Americans that our major parties nominated for national office five times (the other was Franklin Roosevelt). The dozen or so already-announced Democratic candidates seem to be following Nixon’s rule but with more reckless abandon than Nixon ever did. Maybe they figure that whoever gets the Democratic nomination will inevitably beat President Trump. After all, no one they ever talk to would vote for him. But a skewed sample can produce misleading results. If Trump’s job approval hasn’t risen above 44 percent level since March 2017, it has not fallen below 40 percent either this year or last. 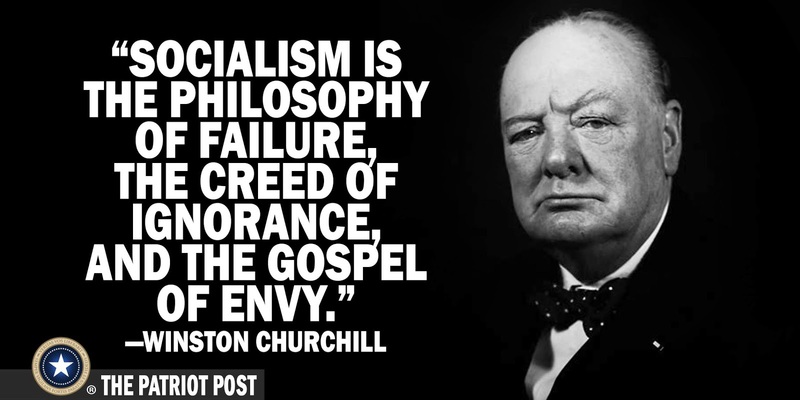 That’s about where opinion was when he got elected. And remember that his national rating is depressed by 2-to-1 disapproval in California, which casts 10 percent of the nation’s votes. He’ll never win its 55 electoral votes, but in 2016, he carried the other 49 states and D.C. by 1.4 million votes. Like his three predecessors at this point in their first terms, he seems vulnerable. 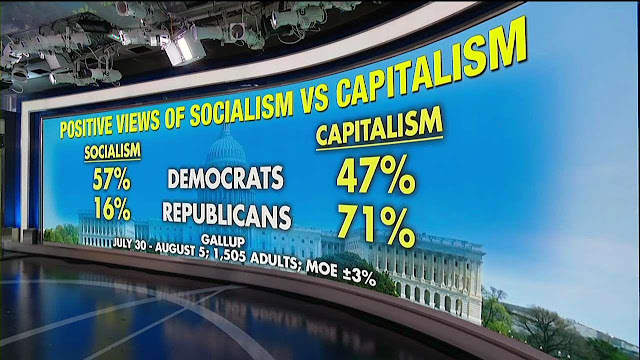 But each of them was reelected. 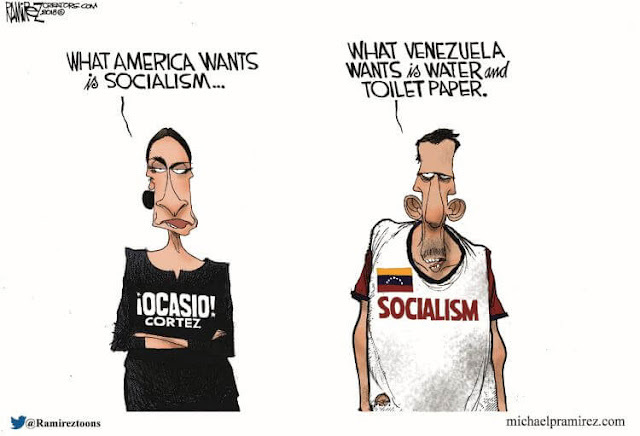 Despite this, Democratic presidential candidates have been going out on potentially shaky left-wing limbs, including the Green New Deal sketched out by the exuberant freshman Rep. Alexandria Ocasio-Cortez, D-N.Y. Endorsers include putatively serious candidates such as Sens. Cory Booker, Kirsten Gillibrand, Kamala Harris, Amy Klobuchar, Bernie Sanders, and Elizabeth Warren. The idea is to ban net carbon emissions in just 10 years. This evidently means no gasoline-powered cars, no beef from methane-producing cattle, and no passenger airplanes. 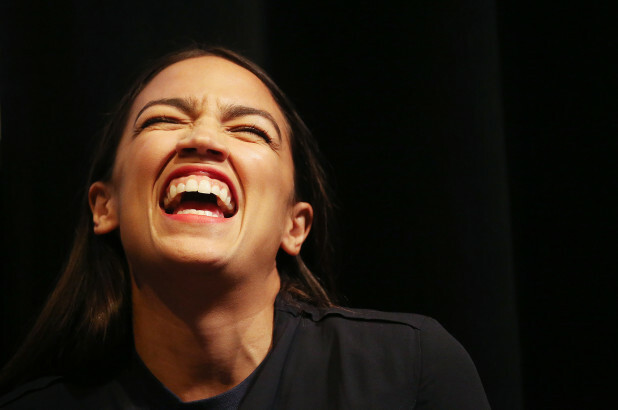 AOC wants a national passenger rail network “so that air travel becomes unnecessary.” Also, guaranteed jobs, free college, and government-provided healthcare — a solution to all problems, it seems, to be financed by printing money. Obamacare, which passed nearly 10 years ago, is no longer enough for Democrats. In his 2016 campaign, Bernie Sanders called for “Medicare for all,” and he and other declared candidates are echoing that this cycle. When asked about the large majority who are satisfied with their current health insurance, Kamala Harris said they wouldn’t have to fill out forms any more to get treatments approved. “Let’s eliminate all that,” she said, without getting into details. “Let’s move on.” More than 100 House Democrats are sponsoring a bill to do just that. Then, there is the issue of reparations for descendants of slaves, urged without much visible effect by longtime Rep. John Conyers and author Ta-Nehisi Coates, whose widely praised bestseller argued that America today is just as racist as ever and always will be. Polls show this position to be unsurprisingly unpopular. But Harris, Warren, and fellow candidate Rep. Julian Castro have now all signed on for “some form” of reparations. 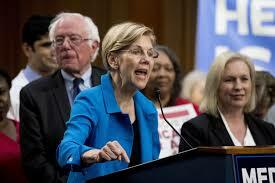 Democratic presidential candidates, perhaps isolated in liberal cocoons, don’t seem to understand their vulnerability on issues like reparations, ninth-month abortions, and the Green New Deal. They assume their media friends can rescue them. But what if they can't? President Trump abruptly walked away from negotiations with North Korea in Vietnam and headed back to Washington on Thursday afternoon, saying the U.S. is unwilling to meet Kim Jong Un's demand of lifting all sanctions on the rogue regime without first securing its meaningful commitment to denuclearization. Trump specifically said negotiations fell through after the North demanded a full removal of U.S.-led international sanctions in exchange for the shuttering of the North's Yongbyon nuclear facility. Trump and Secretary of State Mike Pompeo told reporters that the United States wasn't willing to make a deal without the North committing to giving up its secretive nuclear facilities outside Yongbyon, as well as its missile and warheads program. 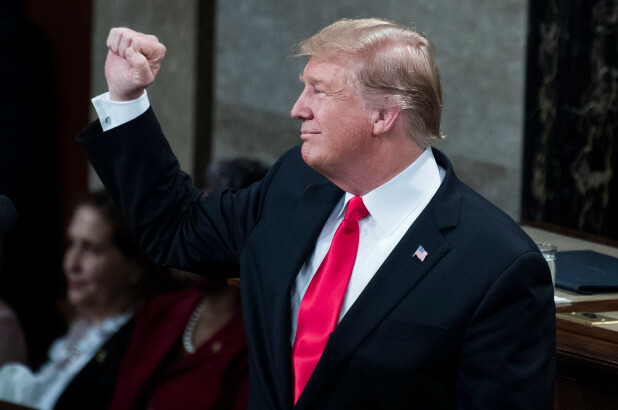 "I'd much rather do it right than do it fast," Trump added, echoing his remarks from earlier in the day, when he insisted that "speed" was not important. "We're in position to do something very special." 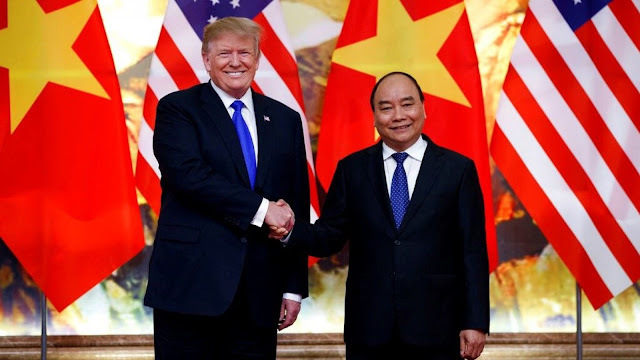 Both leaders motorcades roared away from the downtown Hanoi summit site within minutes of each other after both a lunch and the signing ceremony were scuttled. Trump's closing news conference was moved up, and he departed for Washington on Air Force One several hours ahead of schedule. "Sometimes you have to walk." The president said he trusted Kim's promise that he would not resume nuclear and missile testing, but that the current U.S. sanctions would stay in place. “No agreement was reached at this time, but their respective teams look forward to meeting in the future,” White House press secretary Sarah Sanders said in a statement prior to Trump's press conference. As for a potential third summit, Trump remained noncommittal. Kim had signaled during an earlier, unprecedented question-and-answer session with reporters that he is "ready to denuclearize," reaffirming a commitment long sought by the Trump administration and the international community. “If I’m not willing to do that, I won’t be here right now,” Kim said through an interpreter. "That's a good answer," Trump replied. Trump and Kim signed a document during last year's summit in Singapore agreeing to work toward the "complete denuclearization of the Korean Peninsula," but tensions have since flared between the two nations, and North Korea later said it would not remove its nuclear weapons unless the U.S. first reduced its own nuclear threat. A working lunch was supposed to get underway between the two leaders in Vietnam on Thursday afternoon, after a whirlwind day on Capitol Hill that threatened to steal the spotlight from the second major summit between the two leaders. But neither Trump nor Kim showed up. Earlier, history appeared to have been made when Kim answered questions from a foreign journalist -- almost certainly for the first time ever. Asked by a member of the White House press pool about his outlook for Thursday's summit, Kim said: "It's too early to say. I won't make predictions. But I instinctively feel that a good outcome will be produced." South Korea's Unification Ministry, which deals in affairs with North Korea, couldn't confirm whether it was the first time Kim answered a question from a foreign journalist. Asked if he was willing to allow the U.S. to open an office in Pyongyang, Kim said through a translator, "I think that is something which is welcomable." Reporters didn't get opportunities to ask questions of Kim during his three summits with South Korean President Moon Jae-in and his four meetings with Chinese President Xi Jinping. Kim ignored questions shouted at him during his first summit with Trump last June in Singapore. Trump, speaking next to Kim at the Sofitel Legend Metropole Hanoi hotel, said that "a lot of great ideas" are "being thrown about." He asserted that "when you have a good relationship, a lot of good things happen." 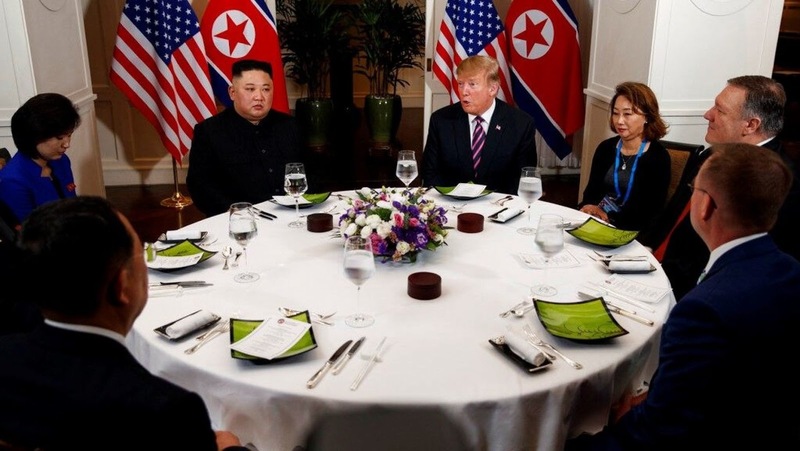 "I just want to say: I have great respect for Chairman Kim, and I have great respect for his country," Trump told reporters as he sat at a table across from Kim in Hanoi. "And I believe it will be something -- hard to compete with for other countries. It has such potential." 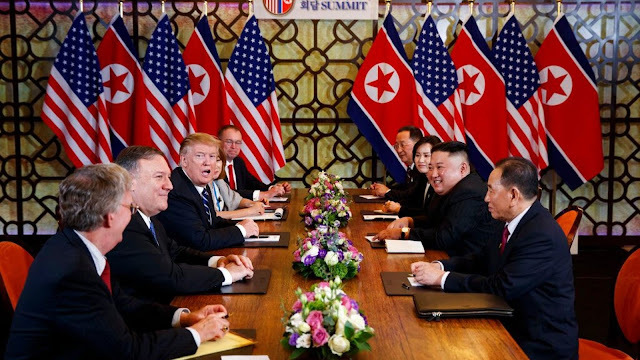 Kim, meanwhile, said the "whole world" was watching the talks and suggested that, for some, the image of the two "sitting side by side" must resemble "a fantasy movie." Trump added that while reaching a lasting agreement was critical, "speed is not important." 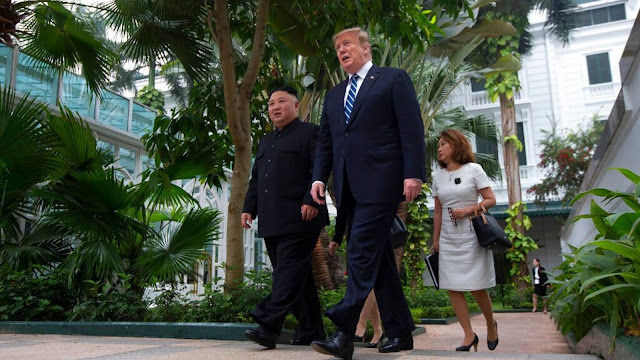 The two leaders then retired to begin their negotiations privately, but were photographed shortly afterward walking on the Metropole hotel's pool patio, where they were joined by Secretary of State Mike Pompeo and North Korean official Kim Yong Chol. Last year, at the Singapore summit, Trump caught U.S. ally South Korea off guard by announcing the suspension of major U.S. military exercises with the South. Trump critics said he squandered critical U.S. leverage before the North had taken any concrete steps toward denuclearization. As Thursday's talks were ongoing, Moon, the South Korean leader, said he plans to offer new proposals for inter-Korean engagement following the high-stakes nuclear summit. Moon's announcement is planned for a Friday ceremony marking the 100th anniversary of a 1919 uprising by Koreans against Japan's colonial rule and will likely include plans for economic cooperation between the rival Koreas. But after the summit, South Korea's presidential office said it was "unfortunate" that Trump and Kim had failed to produce an agreement. But South Korea said it expects "active dialogue" to continue between Washington and Pyongyang. The Blue House said Thursday it believes Washington and Pyongyang deepened their understandings of each other during their "long and deep discussions" in Hanoi. 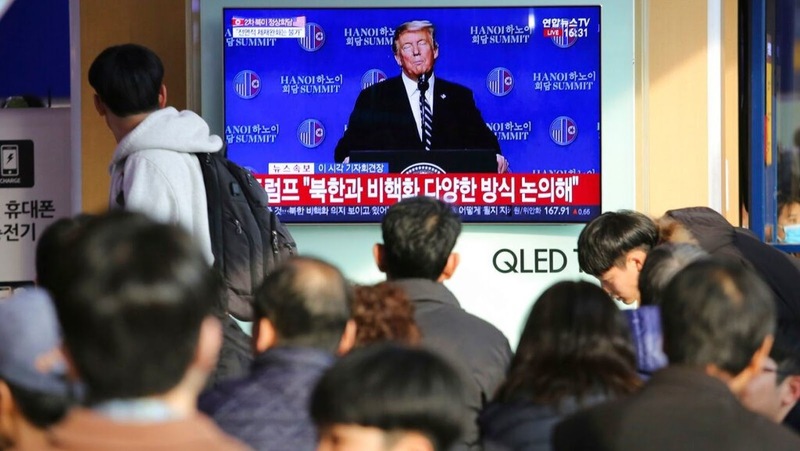 It said Trump raising the possibility of sanctions relief in exchange for nuclear disarmament steps from the North shows that the nuclear negotiations between the countries have entered an "elevated level." The collapse of the Trump-Kim summit could prove to be a setback for Moon, whose ambitions for inter-Korean engagement hinge on a nuclear breakthrough between Washington and Pyongyang. Air Force One is scheduled to refuel in Anchorage, Alaska, before returning to Joint Base Andrews outside Washington late Thursday. The legal fixer unloads on his former boss, with little new information. Are you not entertained? That disdainful line from “Gladiator” came to mind watching Democrats and Republicans maul each other Wednesday over Michael Cohen’s long denunciation of Donald J. Trump. Democrats will need more than the testimony of a former fixer to impeach him. Mr. Cohen spared no nasty noun in describing the mogul turned President he served—blindly he now says—for 10 years. “Con man,” “racist” and “cheat” were highlights, as Mr. Cohen unburdened himself of what he called a decade of lies. He admitted lying for years to protect Mr. Trump, including to Congress, though he now says he’s telling the truth to ruin him. He will soon serve a three-year sentence for his crimes, most unrelated to Mr. Trump. Yet there is no evidence that Mr. Stone ever communicated with Mr. Assange, and Special Counsel Robert Mueller’s indictment makes no such claim. Mr. Cohen offered no evidence that Mr. Trump had a hand in hacking or releasing any emails, and it is hardly a surprise if Mr. Trump privately cheered the release of damaging information on Hillary Clinton. He said so publicly during the campaign. Mr. Trump could be in trouble if he lied to Mr. Mueller about what he knew about WikiLeaks, but we won’t know that until the special counsel reports. The same goes for evidence of Russia-Trump collusion, as Mr. Cohen said he had none. Instead he offered “my suspicions” based on overhearing a conversation between Mr. Trump and his son, Don Jr., that suggested Mr. Trump knew in advance about the 2016 Trump Tower meeting with a Russian lawyer. Don Jr. said an unspecified meeting had been "set,” and his father said “OK, good.” The main political risk here would also be if Mr. Trump lied to Mr. Mueller about what he knew. On one point Mr. Cohen helped Mr. Trump by confirming that the President had not ordered him to lie to Congress about when discussions ended over an attempt to build a Trump hotel in Moscow. Mr. Cohen originally told Congress those talks ended in January 2016, though they had stretched into the summer. Instead, Mr. Cohen said he knew Mr. Trump wanted him to lie because his former boss talks in “code.” Don’t try using that as evidence in court. More factually substantial was Mr. Cohen’s account of his hush-money payments to two women during 2016, including one in October. The fixer said that Mr. Trump’s order to pay came soon after the Access Hollywood tape “wildfire” and reflected Mr. Trump’s concern that news of the alleged affairs would hurt him with women voters. Part of Mr. Cohen’s December conviction related to his role in what prosecutors said was this campaign-finance crime. Mr. Cohen showed a personal check from Mr. Trump to reimburse him for the payoffs, and it’s hard to dispute that the President lied to the public about his involvement. It’s also another self-inflicted wound since Mr. Trump didn’t need to pay the women. Every sentient voter knew Mr. Trump’s history with women, and he was running against a woman who had defended her husband’s mistreatment of other women. One explanation is that Mr. Trump wanted to conceal the alleged affairs from his wife, and Mr. Cohen admitted that Mr. Trump asked him personally to lie to Melania Trump. But that might help Mr. Trump on campaign-finance liability since his marriage is unrelated to the campaign. Former Sen. John Edwards was acquitted of similar charges in 2012. How much will it matter politically? Little in Wednesday’s hearing spoke well of Mr. Trump, but little of it will surprise Americans or by itself rise to an impeachable offense. But the impeachment machinery is now up and running. Democrats may find it’s not easy to stop, though they’ll need witnesses who are more credible than Michael Cohen. A CNN panel acknowledged Wednesday that President Trump’s former attorney Michael Cohen was likely lying in his Congressional testimony Wednesday when he told Rep. Jim Jordan (R-OH) that he had not wanted a job with the White House. CNN’s Dana Bash called that claim into question, pointing out that CNN’s reporting indicated that Cohen was indeed eagerly seeking a position in the White House. “I think the issue there is that one sentence. ‘I did not want to go to the White House.’ All of our reporting suggests that’s not true,” Tapper emphasized. Rep. Jordan suggested Cohen had wanted to work in the White House early on in the House Oversight Committee’s questioning. “You wanted to work in the White House, but you didn't get brought to the dance," Jordan said. Cohen vehemently denied that claiming he was "extremely proud to be personal attorney to the president of the United States of America." 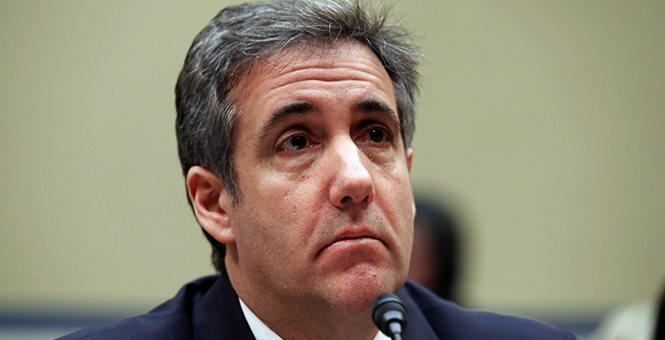 "I can tell you a story of Mr. Trump reaming out Reince Priebus because I had not taken a job where Mr. Trump wanted me to, which was working with Don McGahn at the White House general counsel," Cohen claimed. Donald Trump Jr. and Eric Trump both tweeted contradictions Wednesday of Cohen’s claim that he did not want a White House job. 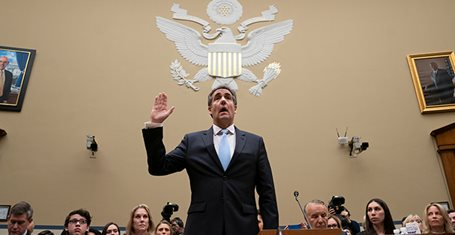 In December, Cohen was sentenced to three years in prison after he pleaded guilty to a series of charges including bank fraud, campaign finance violations, and one count of making a false statement to Congress. President Trump praised his "special relationship" with North Korean leader Kim Jong Un and said "a lot of things will be solved" during the two leaders' second summit in Vietnam as they prepare for a full day of formal talks. Trump and Kim kicked off their second summit on Wednesday by exchanging handshakes and laughs at the Sofitel Legend Metropole Hanoi. They briefly spoke to reporters, where Trump said the biggest progress since the historic Singapore summit was the two countries' relationship. "It's really a good one," he added. “It’s an honor to be with Chairman Kim," Trump said after exchanging handshakes with Kim. "I thought the first summit was a great success and I think this one, hopefully, will be equal or greater than the first." The president told Kim that he believes North Korea "has tremendous economic potential, unbelievable, unlimited." "I look forward to watching it happen and to helping it to happen and we will help it to happen," he added. When asked if he would formally declare an end to the Korean War, Trump simply said, "We will see." Kim also echoed Trump's sentiment. "Those 261 days [since we met in Singapore] were the days during which a lot of painstaking efforts were necessary and a lot of patience was needed. 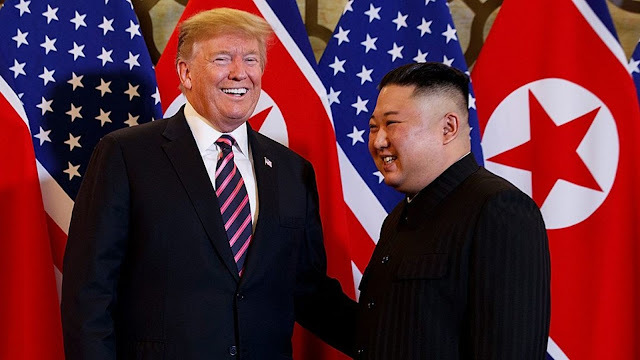 As I see you here today…that gives us a hope that we will be successful this time…" Kim said, according to his personal translator, to which Trump replied, "That’s nice, that’s really nice, thank you." Trump and Kim met briefly before attending a "social dinner" where Trump teased a "very busy day" Thursday that hopefully "a lot things are going to be resolved." "I hope and I think it'll lead to wonderful it'll lead to really a wonderful situation long term. And our relationship is a very special relationship," Trump said. Trump and Kim arrived in Hanoi Tuesday just hours apart for their second summit — eight months after the leaders made history for their first meeting in Singapore. Prior to Wednesday evening's meeting, the president said he "will try very hard to work something out on Denuclearization." He also mentioned making North Korea an "Economic Powerhouse," but did not elaborate on what the U.S. plans to do to help the country. 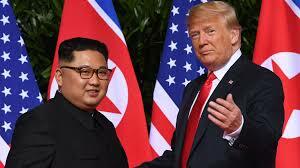 The second summit comes amid a stalemate on denuclearization talks between North Korea and the U.S. Trump has signaled some flexibility on his previous demands that North Korea denuclearize before it sees some relief from crushing U.S. and international sanctions. North Korea, however, has ramped up its rhetoric in recent months and said it will never give up its nuclear weapons unless the U.S. removed its nuclear threat first and lift sanctions cripplings its economy. 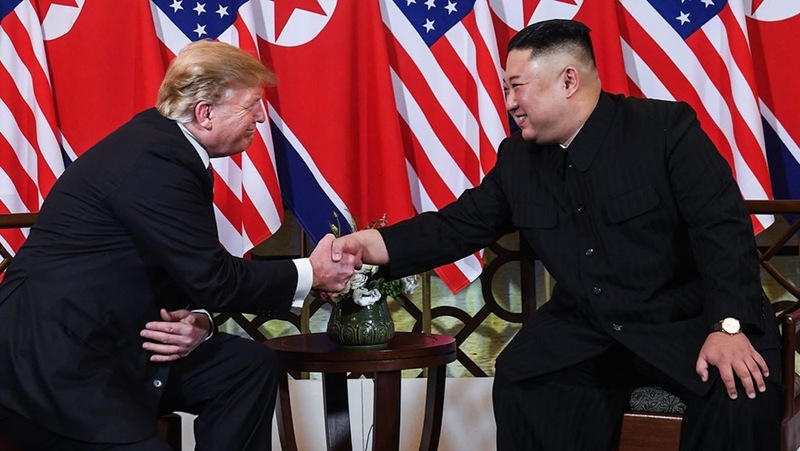 Several other topics are expected to come up during the two-day summit, including bringing back the rest of the remains of U.S. soldiers killed in the Korean War. North Korea turned over 55 boxes of presumed remains of U.S. soldiers killed in the Korean War as part of the agreement from the June summit. There’s also growing speculation that Trump may offer an announcement of peace and a formal end to the Korean War if he can convince Kim to commit to denuclearization. The Korean War ended in 1953 with an armistice, essentially a cease-fire signed by North Korea, China and the 17-nation, U.S.-led United Nations Command that was supposed to be replaced by a formal peace treaty. But both sides instead settled ever deeper into Cold War hostilities marked by occasional outbreaks of violence. 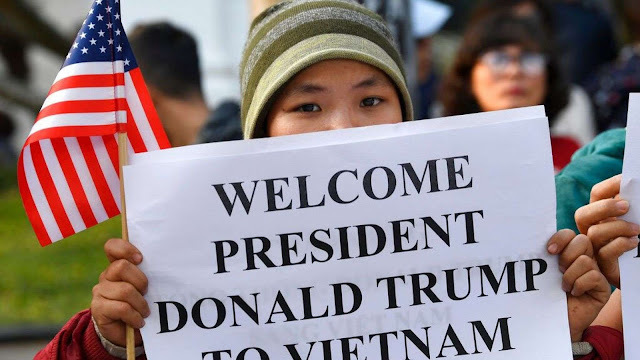 Trump has already met with Vietnamese President Nguyen Phu Trong for the signing of several commercial trade deals affecting the airline industries of their two countries. President Trump’s former lawyer and fixer Michael Cohen has been disbarred, The Post has learned. The decision, which follows his felony conviction for lying under oath, was announced in documents filed Tuesday by Manhattan’s Appellate Division, First Department and the Attorney Grievance Committee. Cohen, who Tuesday began his marathon three days of testimony on Capitol Hill against Trump, did not immediately respond to a request for comment. The decision applies only to New York State, the only place where he was admitted to the Bar. He was first admitted in 1992. It appears the ruling was not scheduled for dissemination until Thursday, Feb. 28, which is the date they are stamped. The Attorney Grievance Committee moved to strike Cohen’s name from the roll of attorneys following his August 2018 guilty plea to charges of making false statements, tax evasion of and campaign finance violation, per the docs. The committee again requested in December his name be stricken following his second conviction on charges of making false statements to the U.S. Congress. “[Cohen] served on several matters as an attorney to President Trump, when the latter was CEO of the Trump Organization. Respondent was charged in connection with his appearances before the Senate Select Committee on Intelligence (SSCI) and the House Permanent Select Committee on Intelligence,” the papers read. 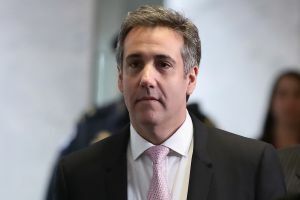 While lawyers are automatically no longer able to practice law following felony convictions, Cohen’s name remained in the New York city rolls until Tuesday. Cohen is scheduled to report to prison on May 6 to begin serving out his three-year sentence. President Trump landed Tuesday in Vietnam for his crucial summit with North Korean leader Kim Jong Un -- the president's second meeting as part of a bold push to rein in Pyongyang's nuclear ambitions. “Looking forward to a very productive Summit,” Trump tweeted on Monday before boarding Air Force One. 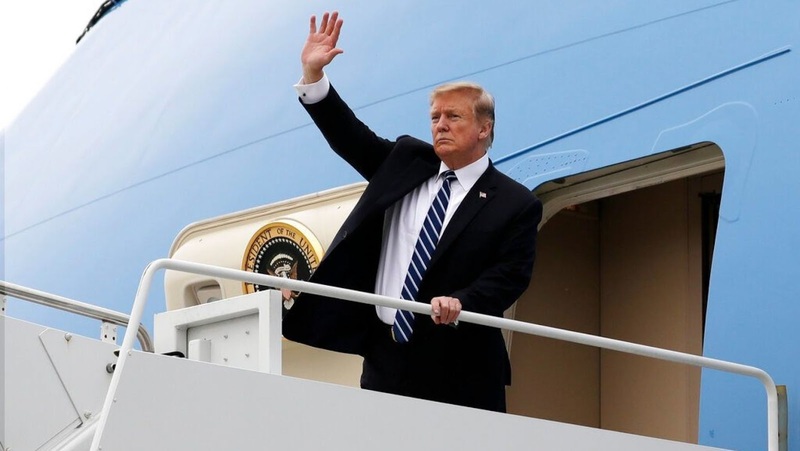 Trump landed in Hanoi hours after Kim arrived by armored train. The summit will take place later this week. Officials in Hanoi told The Associated Press that they only had about 10 days to prepare, but promised airtight security for the two leaders. But the chaotic preparations included the White House press corps being shifted to a new hotel before Kim arrived. Kim subsequently toured parts of Hanoi, where locals stood behind barriers to catch a glimpse of the leader of the hermit kingdom. Trump has repeatedly hailed his meeting with Kim in Singapore last June as a success, although there were few concrete outcomes from the summit. 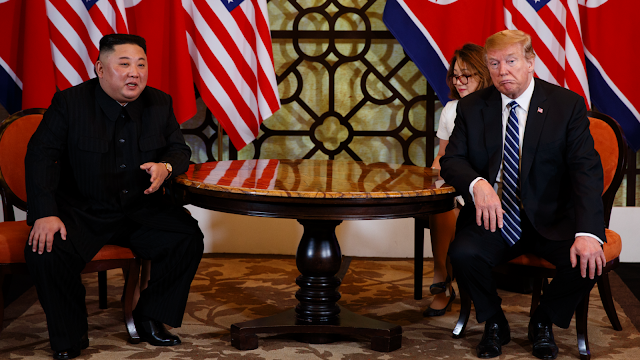 North Korea initially turned over 55 boxes of presumed remains of U.S. soldiers killed in the Korean War as part of the agreement from the summit, although it has not yet followed through with returning additional remains. North Korea also pledged to work “toward” complete denuclearization, something critics say the communist regime has not adequately honored either. Pompeo said he hoped to put a "road map" in place, but would not discuss the possibility of declaring a formal end to the Korean War or pulling some American troops from South Korea, in keeping with his stand against publicly discussing the issue that could arise during the negotiations. But Fox News is told that the White House, State Department, Defense Department, Treasury Department and Energy Department are concerned about where Special Envoy to North Korea Stephen Biegun is moving with negotiations -- and that he is "getting too far over his skis." One particular concern is that denuclearization, seen by many officials as non-negotiable, has now become a negotiating item. 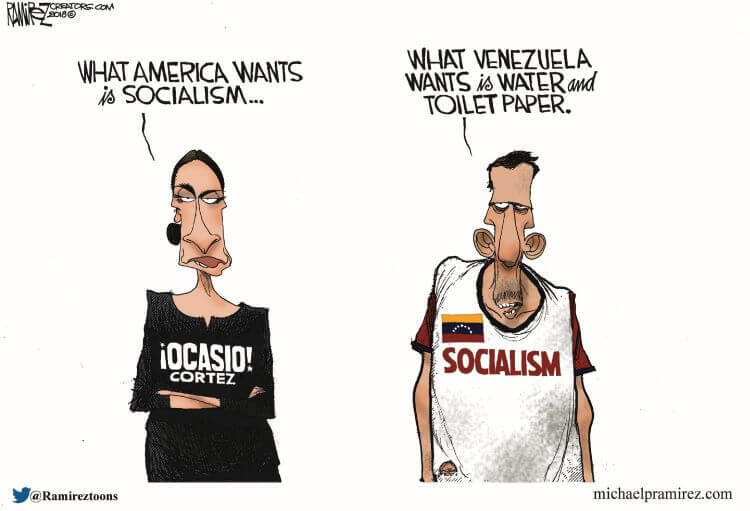 There is a belief among many officials that "we don't want to make a deal just to make a deal", and that "we don't want to give away something for nothing." Fox News’ John Roberts, Lucas Tomlinson, Jennifer Earl and The Associated Press contributed to this report.